So, you want to volunteer at the Roulant? Wonderful! Fill out the form below to send your basic information directly to our Volunteer Coordinator. If you are interested in corporate volunteering opportunities, contact us now! 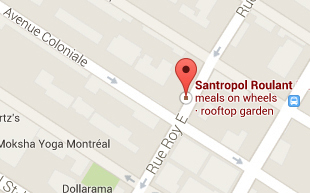 Santropol Roulant does not require a criminal record check in order to volunteer. However, we work with a diverse volunteer base and with a vulnerable population within our Meals-on-Wheels program. Therefore, if you have been convicted of a criminal offense, you must let us know by emailing our volunteer coordinator in order to make sure that volunteering with us will be a good fit. This information will be kept confidential. If you are 12 years old and under: 1) you must be accompanied by an adult during your volunteer shifts 2) kitchen shifts are not possible. If you are between 13 and 15 years old (inclusive): you must be accompanied by an adult during your volunteer shifts. Availability for different volunteer activities vary depending on the season and spots are allocated on a first-come, first-served basis. Outside of these months, we will not be recruiting volunteers for these activities. To volunteer with the collectives (bike repair shop, beekeeping, mushroom growing, vermicompost and fruit picking) please find their page at the following link and contact them directly. Give us an idea of your availability to volunteer! Please keep in mind that most volunteer opportunities are during the day during the week. There is no minimum time commitment to volunteer within our main program areas; you can volunteer on either a regular or occasional basis. We can't guarantee that we will have spots if you are only able to volunteer on Saturdays, as those shifts are usually full throughout most of the year.